Hubbell-Wiring Twist-Lock® Insulgrip® 4-Pole 4-Wire Non-NEMA polarized locking plug in black/white color, accommodates wire of size 8 - 16-AWG. It features ribbed nylon construction for providing secure grip, impact and chemical resistance. Plug withstands voltage rating of 120/208-Volt AC and current rating of 20-Amps. 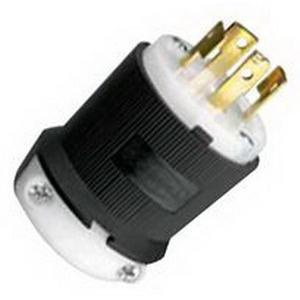 Plug with screw terminal connection, has cord range of 0.35 - 1.15-Inch. It withstands dielectric strength of 2000-Volts. It employs superior cord grip design for protecting terminations from excess strain. It measures 2.75-Inch x 2.33-Inch. Plug with brass blade, features integral dust shield that protects wiring chamber from dust or contaminants. Plug withstands temperature rating of -40 to 75 deg C. Locking plug is UL listed.